HISTORY has now taken its place among the Sciences which must be studied on the principle, and according to the methods, of the Division of Labour. Its larger outlines have indeed been traced already, and some of them, at least, by master hands. But our growing knowledge has raised a growing sense of the volume that we have yet to learn. The problems of human life are felt to be infinitely complex, and the Acts which throw real light upon them, are seen to be of a corresponding character. No one mind can recognise, or record, or classify, more than a fraction of them. Mere out-lines, even when not positively misleading, are at the least wholly insufficient. It is the work of our time to fill up such outlines by the careful study of particular epochs,—of some particular class of facts, —or of some special chain of causes. The field is a wide one, and the harvest is immense. Many who have neither the leisure, nor the learning, to take up the task of the general Historian, may have excellent opportunities of knowing thoroughly doings and transactions which have a deep root and a wide significance. With no other qualification than an eye habituated to the perception of certain truths, such writers may render invaluable service. And if their own business or calling has been of a kind which is connected with the earliest times, and with the oldest elements in human civilisation, any careful analysis of that business, as it has been conducted in the past, and as it exists at the present time, cannot fail to be, at least, a useful contribution to the vast—the yet unaccomplished —work of History. In the following pages I have desired to offer such a contribution—and nothing more. They deal with one great group of causes in our national progress, and they deal with that group alone. Other causes are either not touched at all, or they are alluded to only by the way. Nothing, for example, has been more peculiar in Scotland than the direction which the Reformation took. Few causes have affected so powerfully the national character ever since 1560. But except as connected with the Civil Wars, and some consequent movements of the population, I have left it out of the account. In like manner the immense influences of Literature and Science are passed by, except in so far as both are connected with the progress of the Arts, and of Mechanical Invention. Nevertheless, the special current of events, and the special group of causes which have been followed here, are, beyond all question, among the deepest and most powerful in the History of Civilisation. They concern the amalgamation of Races, the consolidation of a National Government, the beginnings of Law, the rise of Industries, the origin, the growth, and the working of these accepted doctrines of Society which consecrate and establish the respective rights, and the mutual obligations, of Men. I need not apologise for the use I have made of Family Papers. The value of such documents has long been universally recognised as among the best materials of History. Several Literary Clubs did much, in the earlier part of this century, to render them more accessible. Increasing interest is everywhere being taken in them. 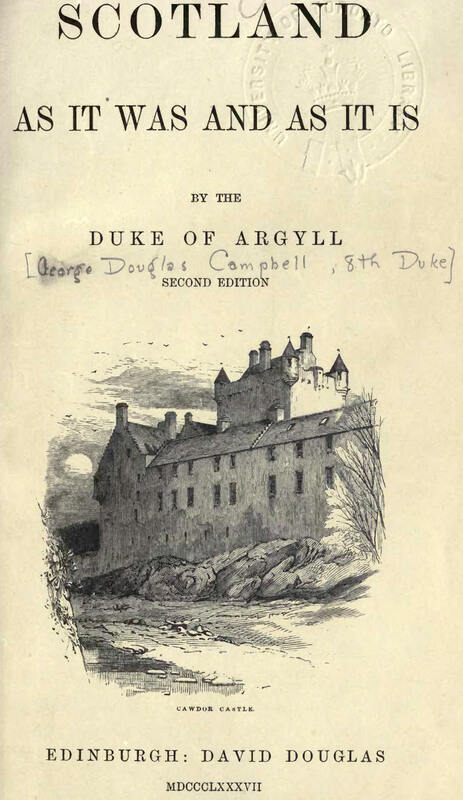 The sumptuous volumes of Family History published under the care, and edited with all the learning, of Sir William Fraser, K.C.B., LL.D., Deputy-Keeper of the Records of Scotland, are a mine of information on the habits and manners of the Military Ages. Yet, unfortunately, few families have taken care to preserve documents giving any details of Estate management. The Black Book of Tayrnouth—often referred to in the following pages—has a special value in this point of view. For the most part, each generation worked, in these matters, unconsciously - not knowing, or even dreaming that in the ordinary administration of Property, they were making History, in one of the most important of its branches. It so happens that documents of this kind, relating to critical epochs, have been preserved in unusual abundance by some of my predecessors. Yet one of the most interesting of these—the Report of Duncan Forbes of Culloden in 1737—was very nearly lost. It was found among the papers of Lady Mary Coke, youngest daughter of John (second) Duke of Argyll and Greenwich, and was returned to me by the kindness of the present Earl of Home, into whose possession it had pased. Old Leases seem everywhere to have been very generally destroyed. Yet it is needless to say that they are very important documents, not only in the History of Tenures, but also in tracing the advancing practices of Husbandry. Of these I am fortunate in having a tolerably complete series from the beginning of the Eighteenth Century, as well as whole Volumes of Instructions in all the details of administering Estates much larger than those which I now possess, issued by my grandfather, John, fifth Duke of Argyll, during the most critical epoch of Agriculture in Scotland, from 1770 to 1806. He was one of the great Improvers of his time; and I have had the further advantage of the large collection which he has left of Books and Pamphlets on all branches of Rural Economy. My only difficulty has been to limit within any reasonable compass the superabundant evidence which all these sources of information afford in illustration of the narrative I have presented of a memorable History. The Woodcuts in this Work have been taken from drawings of my own which pretend to no artistic merit, but which, from having been made chiefly for geological purposes, are scrupulously accurate as regards the outlines, surfaces, and structure, of the mountains. In such scenes as those connected with the view of, and from, Iona, I have always felt it a great pleasure to remember that although all superficial objects, such as buildings, trees, etc., are of comparatively recent date, yet the aspect of the Hills is almost unchanged, and the contours of Sea and Land are exactly as they were when the great Missionary of the early Celtic Church landed on our shores in the Sixth Century. In like manner the scene of Robert Bruce's encounter with the Macdougals, Lords of Lorne, at the foot of Ben Cruachan, is in all probability almost exactly what it was at that time. The drawings of the Mountains of Soulvein, and of Queenaig, in Sutherland, exhibit some of the most remarkable hill-forms in Scotland. These mountains are also of great interest in Geology, consisting almost entirely of the red "Cambrian Sandstone," out of which their precipitous outlines have been cut or broken, by some series of movements, and of other operations, which Science has much difficulty in explaining. The lower hills and rocks from which these curious mountains rise, are all of a totally different material, and of a much earlier period in time. I may add that in the view of Queenaig, the summit at the right-hand extremity of the Range, is the same summit which is depicted, from a different point of sight, in the Frontispiece of the later editions of Murchison's celebrated and classical Geological Work, Siluria. The view on page 484 represents the situation of a cottage which was the home of "Rob Roy" during many years, and in which his children were born. It is between two deep ravines, easily defended. Very lately the handle of his "Skian Dubh," or stocking knife, was found imbedded in the turf, near the walls. It is made of a sheep's horn, and bears, roughly cut upon it, the letters "R. McG"